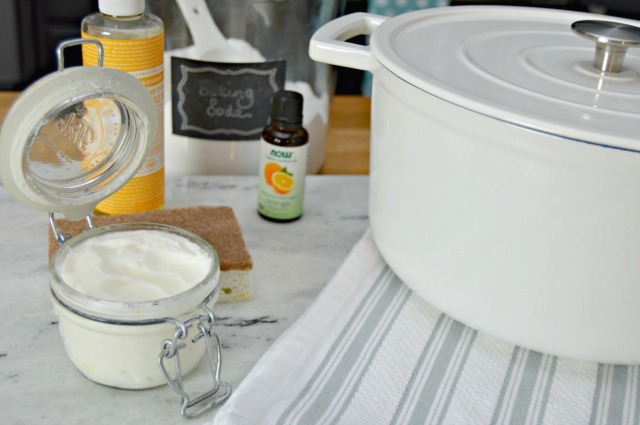 This Homemade Pot and Pan Cleaner is so simple to make, non-toxic, and will get even those pots with burned on food as clean as they were when they were new! One of my favorite pots to cook soups in is my cast iron dutch oven. The only problem is, it isn’t non-stick. Some stuff always sticks to the bottom. I also have a beautiful stainless steel pot that I use often, and it has the same issue. Not to mention, I have a real knack for burning things…just ask my husband about the year I burned his chili right before the chili cook off…not one of my finer moments. Before I started using my homemade cleaning scrub, I would have to soak my pots and pans overnight, and sometimes they still wouldn’t come all the way clean. Now, I just add some of my Pot and Pan Cleaner to a sponge and let it do the work! 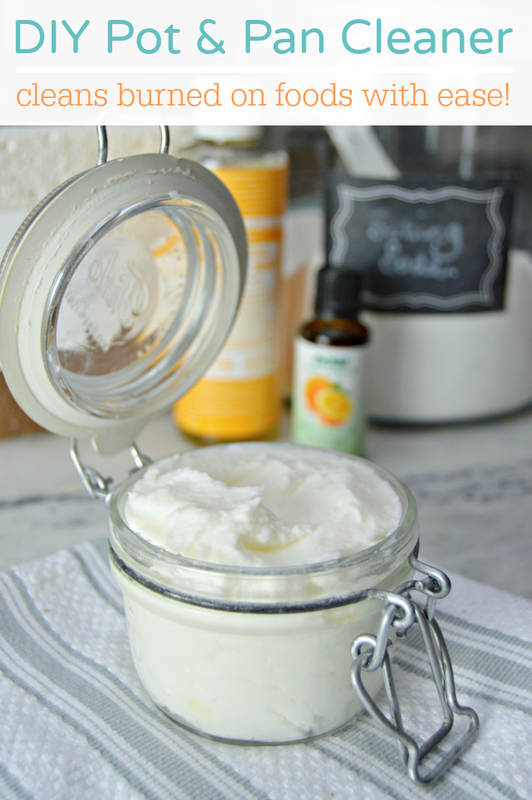 It’s so easy to make with a few household ingredients and will save you a ton of elbow grease and time too! Start by adding all of your ingredients to a bowl. 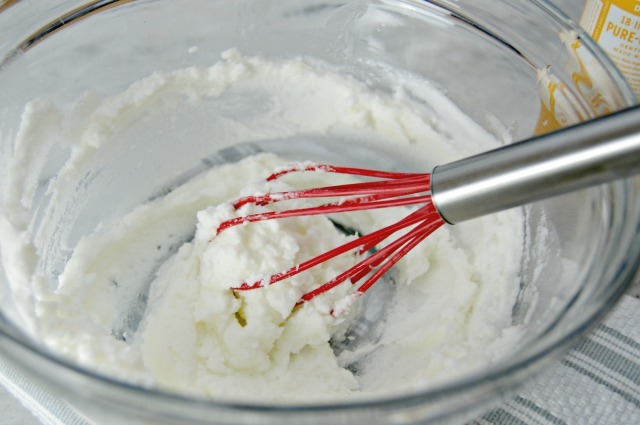 Use a kitchen whisk to mix well. 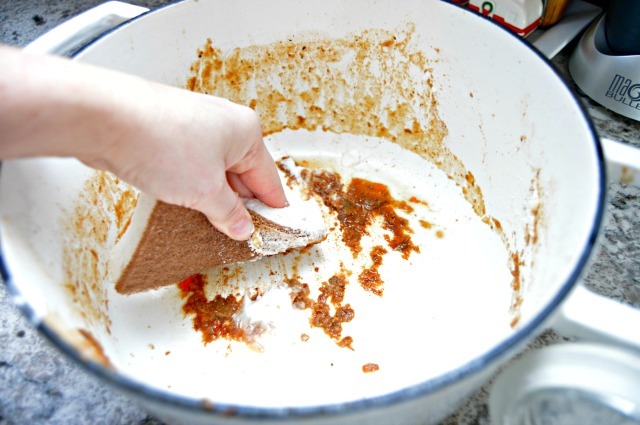 Spoon your paste mixture into a jar or other airtight container. To use, apply some paste to a damp scrub sponge or dish scrubbing brush. Massage the paste into the burned on or dried on food particles. The Castile soap works to clean the pan, the orange oil and baking soda help to lift anything that is stuck to the pan without scratching. For really tough spots, add some more paste and some warm water, then scrub with sponge. I store my Pot and Pan Cleaner Paste in a glass jar and keep it under my sink. 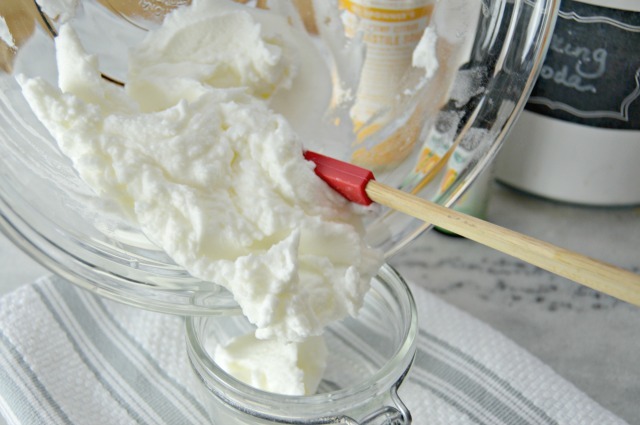 I also use it to remove melted cheese and other stuck on foods from my white ironstone dishes…it works wonders on coffee mug and dish scratches too! Absolutely, Vicki, and in your oven too! Question – could this also be used for Oven Cleaner? Mine needs a cleaning but those in a can oven cleaner always have such awful after smell and most I have found hard to use. Sprays are difficult to control. Definitely, Nancy! I use it all the time for my oven and my stove top too! I used this to clean a nasty plastic garbage pail, my tub, bathroom sink as well at my stove, oven oven and pans. I would be lost without this stuff. 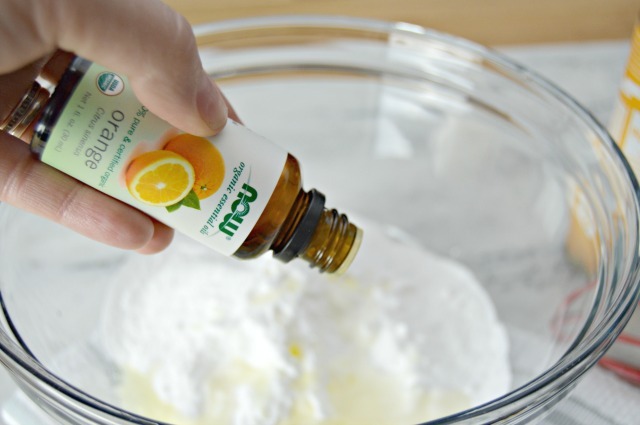 Will lemon essential oil work as well as the orange in this recipe? 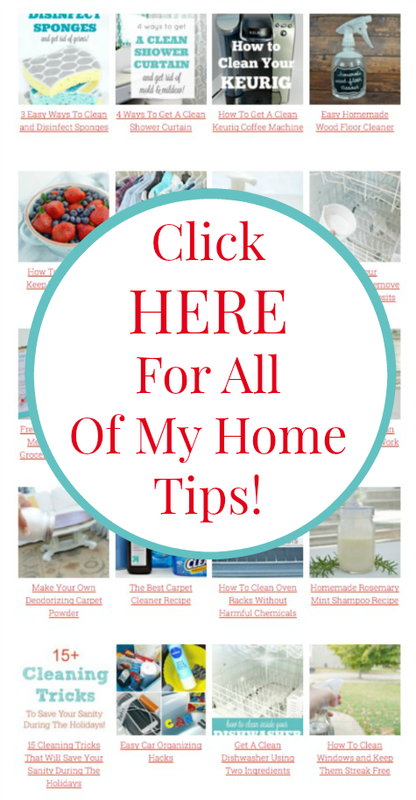 Love your DIYs!!! Is any citrus essential oil suitable? I have grapefruit and mandarin instead. Hi, Tonia! Yes, any citrus oil should work great! About the homemade castle soap…..since so concentrated, are the same amounts used in the recipes for the homemade as the store bought liquid form? Ie: still use 2 Tbs. 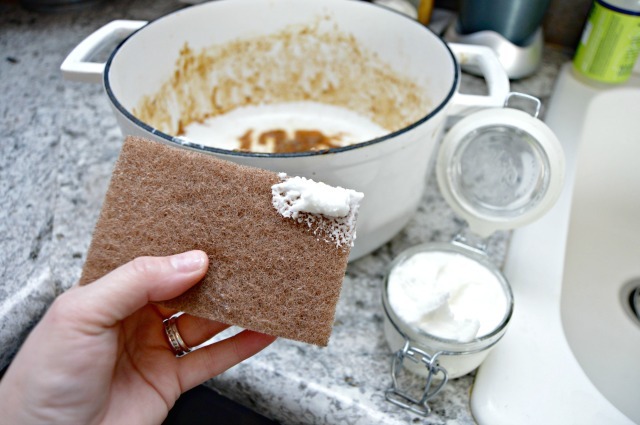 homemade castle soap in this pot and pan paste recipe? In other words, is the homemade castle soap the same concentrate as store bought liquid? Thank you all your input!!!!!!! I used your scrub on my oven. I don’t have the strength to do a heavy scrubbing job. It took me about 90 minutes(because I had to keep stopping) and it was clean to the point that it shined. I sent a picture of it to my daughter on facebook and she had me make her up some as well. 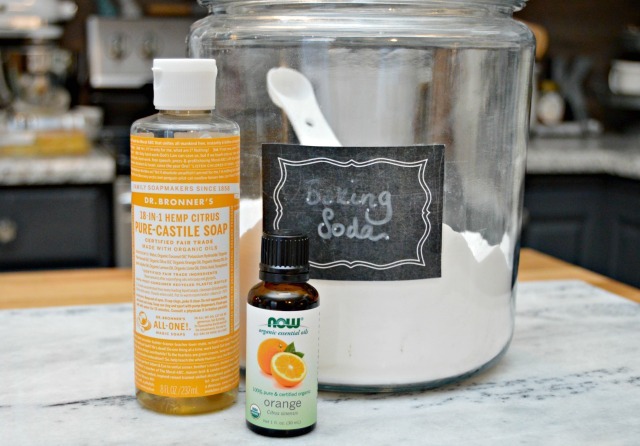 Where do you buy the castile soap +orange oil? Do they have other cleaning products other than the list? Is the homemade castile soap the same concentrate as the store bought liquid?